It occurred to me recently that I had printed almost nothing actually useful on my RepRap 3D printer, aside from parts to improve on or build more RepRaps. I am rectifying that with this project. The goal here is to generate working house keys by inputing the key code of the lock into a parametric OpenSCAD model. Instead of having to explain to my landlord how I ended up with a wedge of plastic jammed in my front door, I ordered a box of (well) used locks and latches from eBay to experiment on. Luckily, the lot includes both Kwikset KW1 and Schlage SC1 locks, which are the two most commonly found in the US. I created an SC1 model to start with, but I’ll probably make a KW1 soon. I’ve uploaded the KW1 model now as well. Designing the key model was actually pretty straightforward. I measured a key with a ruler and calipers and created an approximate model of it that is reasonably easy to print. I then got pin depth specifications and parametrically differenced them out of the model. To generate new keys, you can just edit the last line of the file and enter in the key code for your key. If the code isn’t written on the key, you can measure the height of each bit and compare to the numbers in the Root Depth column on the aforementioned pin depth site. Perhaps more nefariously, you could implement something like SNEAKEY to generate key codes without physically measuring the key. You’ll of course need OpenSCAD to edit the .scad file and generate an STL to print out, unless your key just happens to be 33172 like the example STL posted below. If it is, you can unlock the doorknob currently sitting on my desk. As a small, precise object, this is a great test of how accurate your Skeinforge settings are. You may need to adjust some thicknesses or the built in pin depth fudge factor to get it working properly with your printer. The pictures above show the key being used on a disconnected lock cylinder, but I found it was also strong enough to turn a deadbolt. If your lock needs a lot of force to turn, you may need to cut a space into the key to use a torsion wrench with it. Wow! This is a really neat use of OpenSCAD. I’ll have to see if I can dig up an old lock and key to try it on this week. I am very impressed. My only concern would be durability. This would probably be great if u lost a key i suppose, especially because u could make one then take it to be copied to a brass/zinc blank. I just don’t like the idea of sticking plastic into a lock cylinder, not when i’ve broken so many normal keys lol. Pingback: Πώς να εκτυπώσεις κλειδιά για όλες τις κλειδαριές σε έναν 3D printer! A year ago now… the same project, but also re-designing the key. Very cool. Though that appears to have been a design show of a concept (a very nice one), printed on a high-end 3d printer. 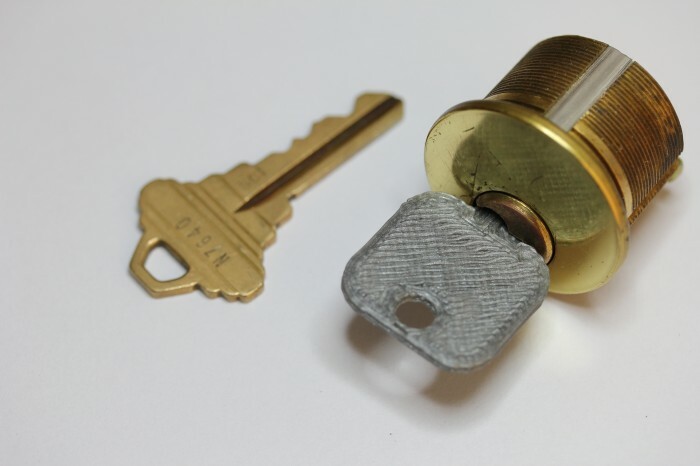 This is a working key printed by a MakerBot, which is an impressive feat. While printing “pre-cut” keys is cool, being able to duplicate the blank+keyway is a nicer trick. Why? Copying common keys isn’t too hard with hand tools, and it only costs $2 or less at most hardware stores. But getting high security blanks can be a challenge and makes research+experimentation a little more challenging. An Easy Entrie key blank duplicator is nice but costs about $10k. Being able to print key blanks is pretty cool, thanks for posting your work. I have a decent collection of high security locks and keys, now if only I had time to make STL’s of them all..
or even silver, but that may fail in some expensive silver grinding action. There’s an undeniable “Ubergeek Cred” about printing a key at all, let alone from non-contact methods. And, in theory, one might stripmine old photos etc for keydata too. Pingback: Why Not Print Your Own Keys? I wish I had a 3D printer, but I can’t afford one right now. 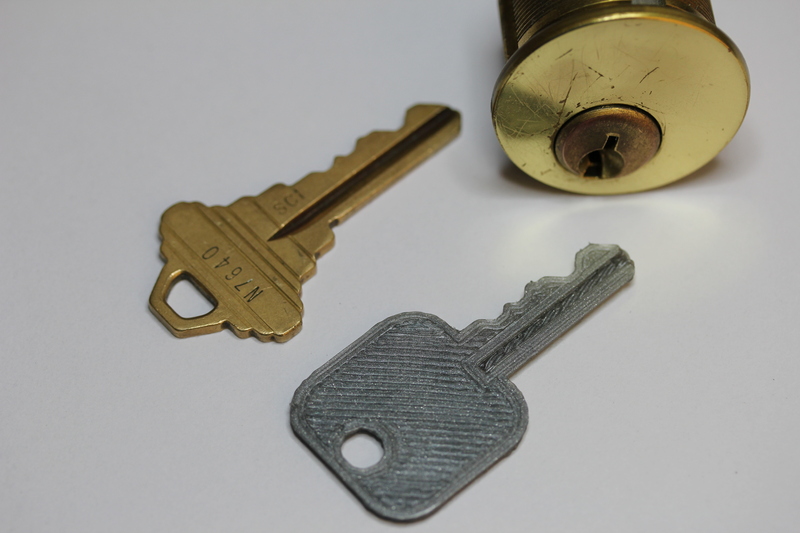 One little mistake you made: Anyone can print a key to your house and get in and rob you. You might have to replace your locks. oh really? he bought a bunch of locks on fleabay to experiment on. Next time your try to read more ok? The members of the sport-lockpicking community I’ve shared this with are very excited about the prospects of printable keys. Thanks for some fun SCAD scripts! Pingback: „Print me up, Scotty“ – drucken wir in Zukunft alle Dinge aus? we’re waiting… where’s the stl’s for the kw1 and sc1 bump keys? curious – what 3d res (100 micron?) and material (PLA? )did you use? Could you please publish a modified version of this code for an SC4 Schlage Key?